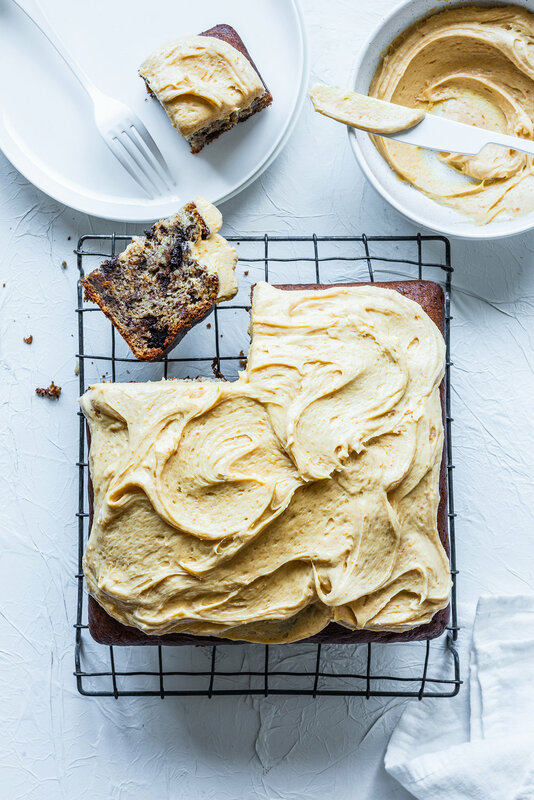 An incredibly decadent and delicious banana cake, dotted with chunks of dark chocolate and finished with a smooth peanut butter cream cheese icing. Preheat oven to 160ºC, grease and line a cake tin. In a large bowl, sift together flour, caster sugar, baking powder and salt. Place milk in a small ramekin and microwave for 20 seconds. Add baking soda and mix to come bine. Once frothed up add to dry ingredients along with eggs, mashed bananas and oil. Roughly chop chocolate and gently fold through. Pour into cake tin and bake for 70 minutes or until skewers comes out clean. Cool on a wire rack. Place cream cheese, butter and peanut butter in a bowl or bowl of a stand-mixer, beat until smooth. Add the icing sugar and vanilla essence and beat for a further 5 - 7 minutes until lightly and fluffy. Once cake has cooled, cover with icing.